When I was in Florida last year, I visited my favorite quilt shop - "The Quilt Place", and stocked up on charm squares. But I messed up - I don't know what I was thinking. 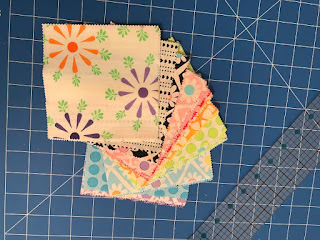 I should always buy at least 2 packs of any charm squares, as I so love making simple block quilts, and 1 pack of 42 squares just doesn't go very far. I only bought one! Well... 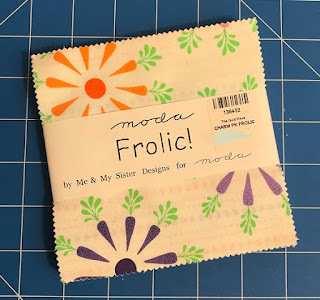 I guess I was thinking "baby quilt". 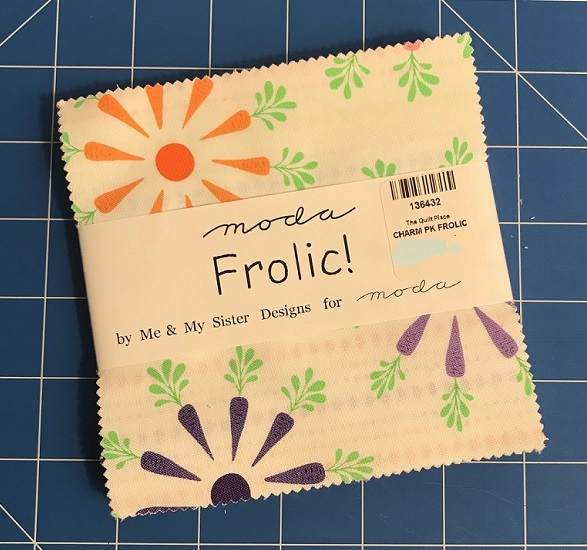 But even so - going to a small baby quilt. Here are some of the prints - very bright, cheery colours! I decided I'd frame all the squares in a snow-white 1.5"lattice. But before putting the lattice together, it's important to know how I want the squares arranged. So here's the grouping I decided on. 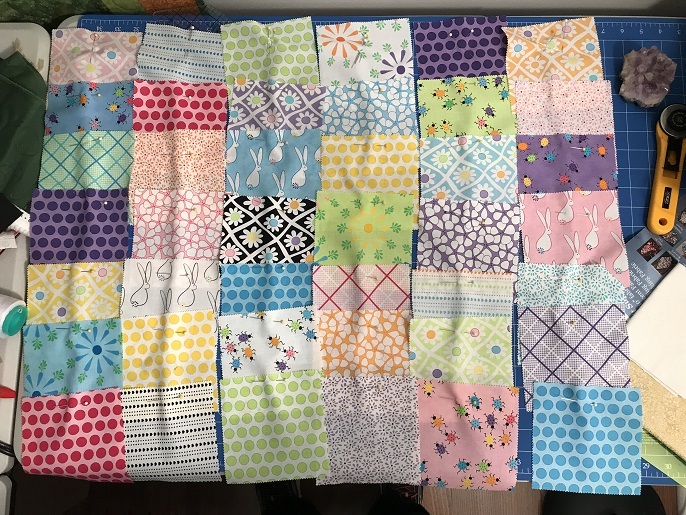 In order to keep everything straight - I always pin the blocks together in strips (as you'll see above if you doubleclick the photo and get the larger version of that picture). Pinning the blocks just makes the most sense to me. As I sew them together, I remove the pin holding 2 blocks and sew them. Then I pick up another strip of blocks and sew 2 blocks from that strip together. A kind of "chain piecing". I do get japped once in a while with the pins, but this is the fastest and easiest way I've seen of doing it. To keep the rows straight, I put pins on the top blocks. One pin for the first row, two in the second, 3 ind the third (as you see in the photo below) and so on. Doing it this way, I can power through the top pretty quickly and never lose track of where the rows go, etc. I'm kinda proud of my technique. Nobody showed me this, I just came up with it on my own.